McDonald's of Jackson recently hosted a McTeacher's Night on Sept. 21 from 4-8pm. McDonald's donated 25% of the proceeds from all sales between 4-8pm back to the Jackson R-2 Foundation. These funds will be used throughtout the distric to award grants for teachers. 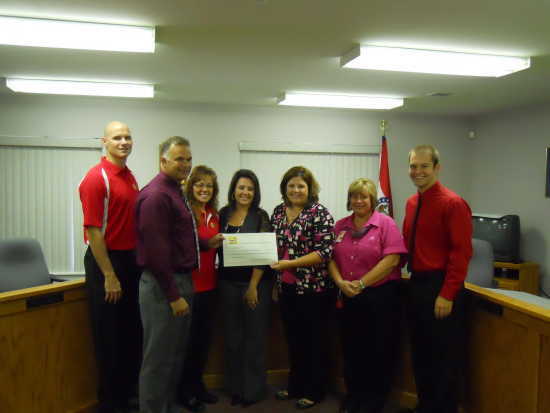 Those pictured to accept the check were: Justin Keen, Kelly Waller, Linda McKinney, Heather Brune, All Board Members, Cheryl Farrow, Area Supervisor McDonalds, Donna Martin, Jackson McDonalds Store Manager, and Ronnie Maxwell, Board Member.